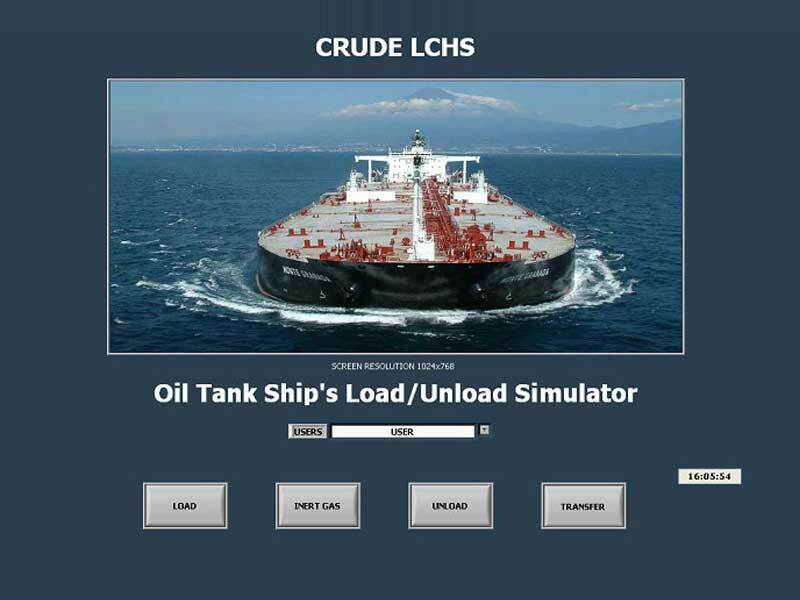 Liquid Cargo Handling Simulator (LCHS) is intended for training tanker personnel in accordance with requirements of Sections A-V/1-1 “Mandatory minimum requirements for the training and qualifications of masters, officers and ratings on oil and chemical tankers” and A-V/1-2 “Mandatory minimum requirements for the training and qualifications of masters, officers and ratings on liquefied gas tankers” of STCW Code. training step-by-step the correct sequences of cargo operations. Simulator software consists of Instructor WorkPlace and desired number of Student WorkPlaces. Instructor has possibility of interference into actions of Student by connecting to them in real time mode. Instructor controls and may influence operations performed by Students. LNG Gas Tanker (Bilbao Knutsen, dwt - 68530 t). Model contains cargo system, consisting of three cargo lines with the pumps, which allows drilling sequences of operations during load and discharge through three manifolds at once. There is a possibility of crude oil washing training and final tank stripping. Model includes Inert Gas System, its launch is possible from fuel injection valves, engine room exhaust gases. It is possible to launch systems in ventilation mode. Simulator provides possibility of ballast operation by isolated ballast. 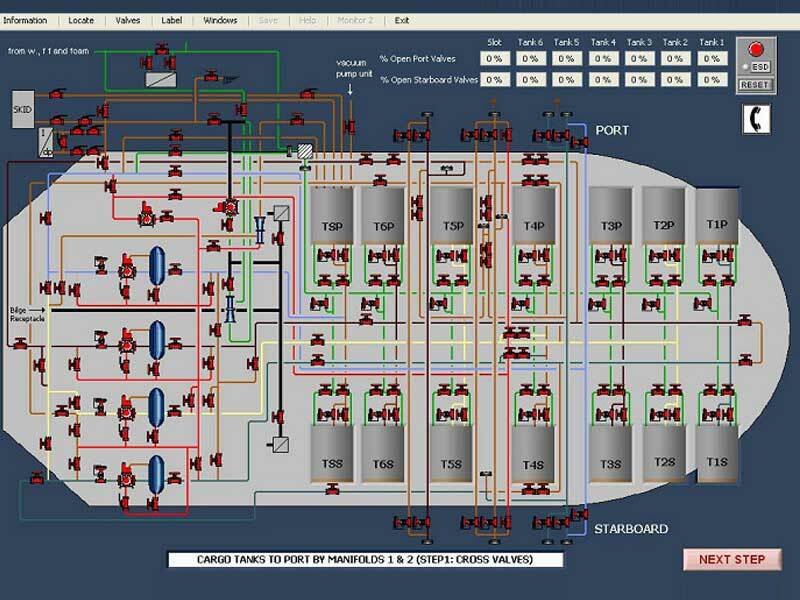 Simulation of cargo pumping is in “ship-to-Ship” mode. Model has function of drilling sequences of operations required for loading, discharge and internal fuel transfers. Model contains 33 cargo tanks, which allow drilling of carrying large amount of chemical cargo types, with due consideration of different cargo compatibility and its correct separation onboard. Each tank has independent cargo system, including a separate cargo pump. Simulator provides possibility of ballast operation by isolated ballast. Model includes Inert Gas System based on Nitrogen gas, produced from micromolecular filters. Model allows drilling of cargo load and discharge operations, including running-ups of training for cargo operations. Simulator also includes launch of Inert Gas System and control of isolated ballast system. Simulator includes possibility of training operations required before entering the dock, and operations needed to perform after leaving the dock before loading the cargo. There is also possibility of simulation ballast passage and passage with loaded cargo, with performing of correct sequences of all required actions for execution of the task. 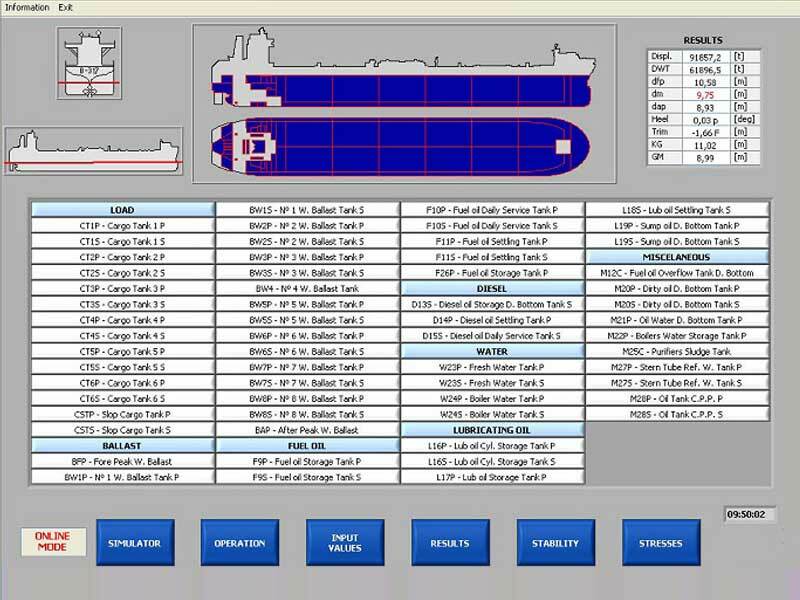 All vessel models include cargo calculation system, which allows controlling static and dynamic parameters of stability, hull strength, draught, list and trim in accordance with IMO requirements. Student has possibility of performing a full cargo operations cycle with possibility of controlling and if necessary inserting changes, when parameters differ from norm, performing this with the use of cargo and ballast systems. Cargo and ballasting operations can be performed in real time mode as well as in accelerated mode. There is possibility of sending messages not only in direction from Instructor to Student but also in opposite direction.